The other day when i cooked Tonjiru (Japanese Pork Miso Soup) 豬肉味噌湯﻿, ﻿i can't finished the whole Burdock root (Gobo). So I use the leftover to deep fry, it was so crunchy and sweet after deep fried. This remind me the Wu Har (Crispy Taro ball) 港式芋虾﻿that i made during last Chinese New Year..but this fried burdock root is more crunchy than Wu Har,this give me an idea to use Burdock root to replace with Yam when i prepare Wu Har next time. 1. 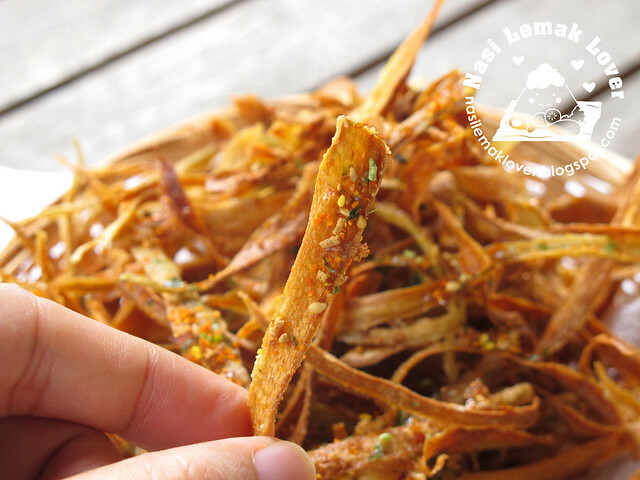 Shred burdock root with a peeler ( can peel with skin on, your choice), soak in vinegar water to prevent color changed (optional). Drain and pat dry. 2. 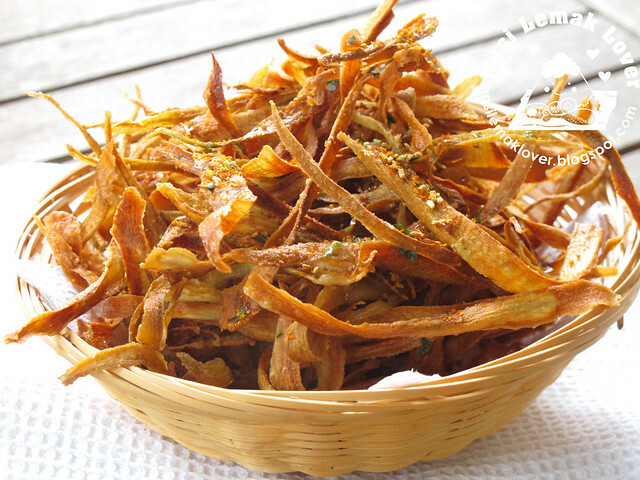 Mix plain flour and tapioca flour with shredded burdock root, mix well. 3. Heat oil in a wok over medium low, deep fry shredded burdock root till golden brown (deep fry small batch at one time), drain on paper towels. 4. 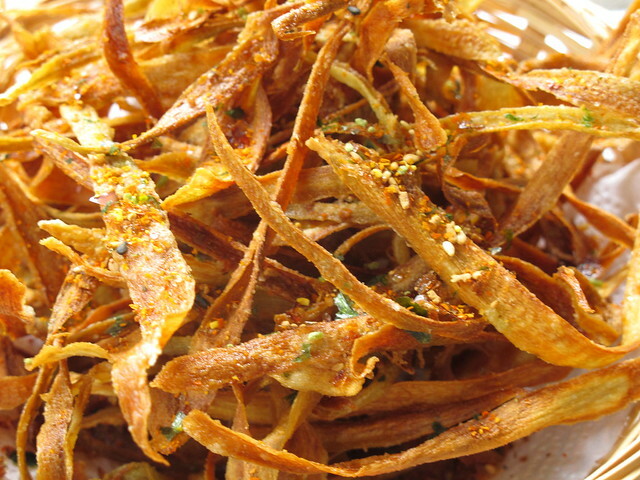 Sprinkle seasonings on the fried burdock root. Store in air-tight container if can not finished the same day. Oh Sonia, this is so interesting! I only know to use burdock to boiled soup. I'm gonna loves this.... as I like chips! 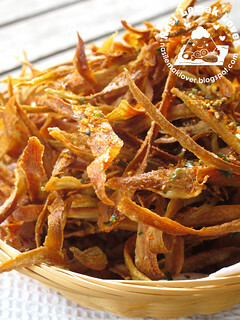 Wa, never knew gobo can be deep fried. Good idea to use leftover gobo, i see you usemquite a bit of gobo, i heard it is a very nutritious veg. wonder how does it taste.... can i have some please? such a fresh idea!! interesting! 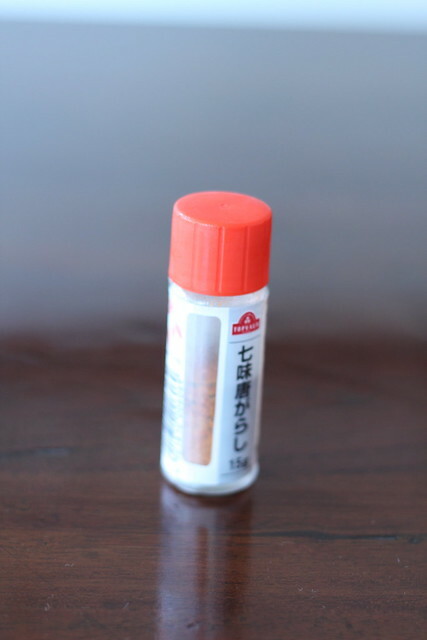 Easier to manage too if use this in place of taro for wooha, at least hands won't be itchy. Une découverte pour moi. Je ne connaissais pas du tout. this is something special and creative. never thought the burdock root can be tranformed to snack. Ooo~~ This is such a great and simple idea! That's a very nice crunchy snack. I like! I've never thought of frying burdock... what a great idea and looks so nice and crispy! Never eaten burdock before, always thought it's only for soup, this crispy version of yours looks delicious! Oh this is new to me...never have this b4. It looks like something tidbits that go well with beer. I am not a big fan of fried stuff but I know my Quay Lo will love these. Burdock is also nice to make into tempura. Hi Sonia, it look good, nice and crispy. P/S I'd posted the step by step pandan roses, you can check it out. lclim, i will take a photo to show you, please check later. Lotus root yes but burdock root? I will google.. I had it the other night at Isaki in Sri Hartamas. Very addictive!